Participants can provide single or multi-digit input with up to five choices. Your staff and users will appreciate the intuitive design and confirmation of each response. The K4 keypad uses two way radio communications. 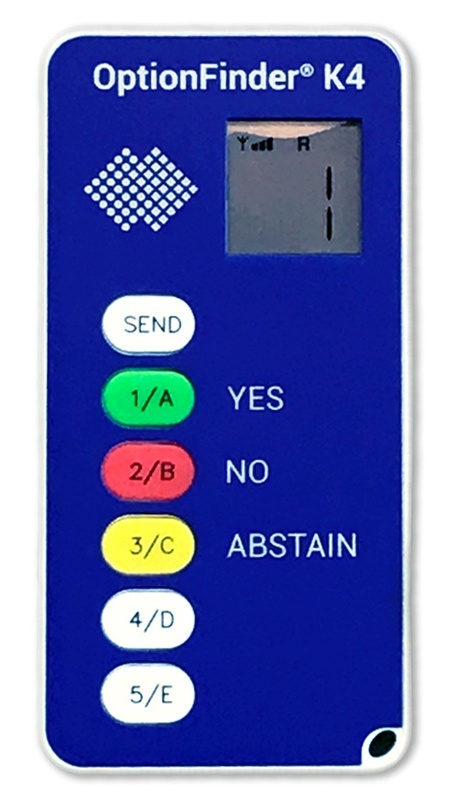 The LCD display provides confirmation that each response has been received. Low acquisition costs and durable, proven manufacturing standards will enhance your bottom line. The molded case is resistant to damage and breakage and the circuitry is designed for long-term reliability and battery life of one year. The small size of the K4 also minimizes shipping and storage costs. Whether you’re looking to expand your interactive options with a new response keypad or to try a response system for the first time, the OptionFinder® K4 is ready to provide great value and ease-of-use.